Believe it or not, this cup fungus is a close relative of the morels--though you would need a microscope to discover why. 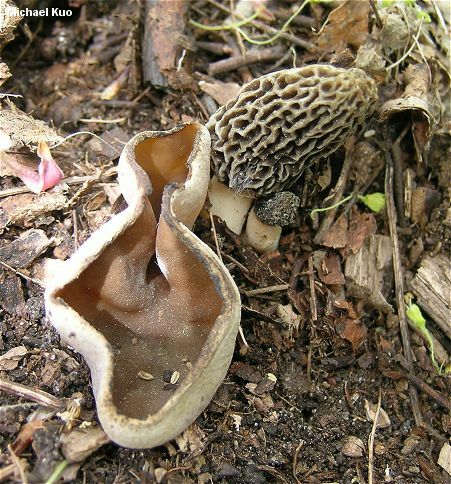 It appears in spring, usually during morel season, and is fairly common and widespread in North America's hardwood forests. 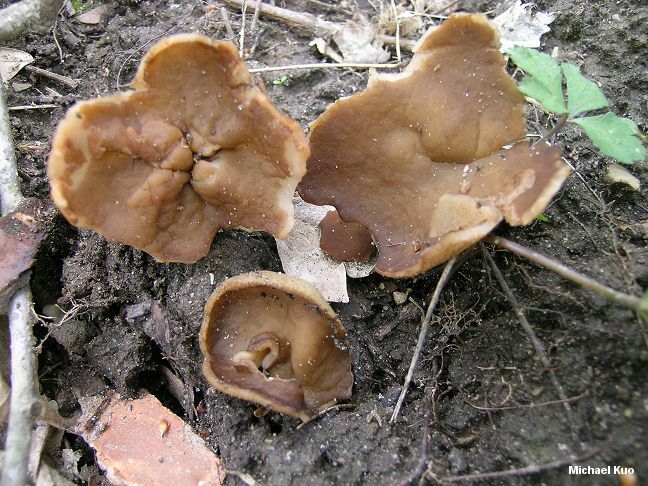 A number of other brownish cup fungi are also common in spring, however, and they can be very difficult to distinguish from Disciotis venosa without microscopic analysis. By maturity, the wrinkled and veined center of Disciotis venosa is often fairly distinctive, but various species of Peziza and Gyromitra (namely, the cup-like species formerly placed in Discina) can be dead-ringers to the naked eye. 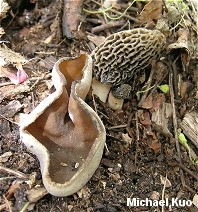 Ecology: Probably saprobic, but since it is closely related to the morels, possibly at least facultatively mycorrhizal; found primarily under hardwoods, in beech-maple and oak-hickory forests in eastern North America, and in riparian woods in the west; growing alone, scattered, or gregariously; spring (usually during morel season); widely distributed in North America. 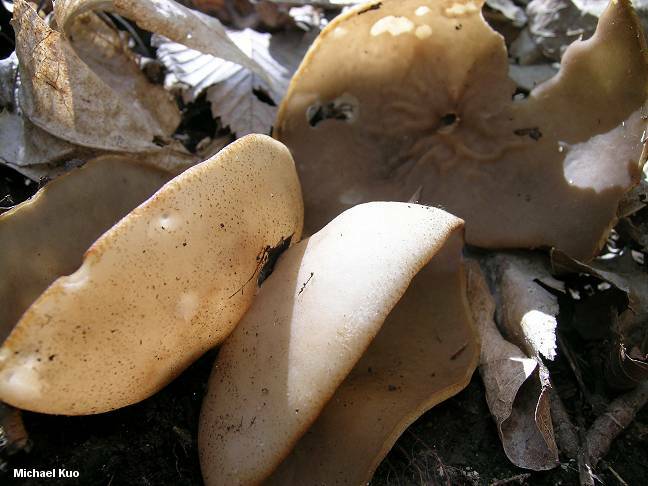 Fruiting Body: 4-21 cm across; shaped more or less like a cup when young, often with a curled-in edge; in age flattening and becoming irregularly saucer-shaped; upper surface yellowish brown to brown or reddish brown, bald; smooth at first but soon becoming wrinkled or veined, especially over the center; undersurface whitish to pale tan, often dotted with tiny brown scales, rough or finely hairy; pinched together in the center to form a very short pseudo-stem that is buried in the ground; flesh brittle and pale brownish. 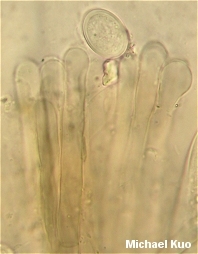 Microscopic Features: Spores 22-25+ x 12-15 µ; smooth; elliptical; without oil droplets; contents homogeneous. Asci 8-spored; not bluing in Melzer's reagent or IKI. 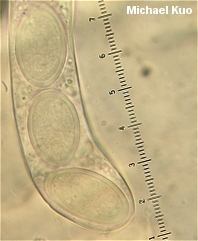 Paraphyses septate; apices clavate to subcapitate; to about 10 µ wide; with brownish contents. REFERENCES: (Persoon, 1801) Arnould, 1893. (Fries, 1822; Saccardo, 1889; Smith, Smith & Weber, 1981; Breitenbach & Krânzlin, 1984; Arora, 1986; Phillips, 1991/2005; Lincoff, 1992; Weber, 1995; Roody, 2003; Kuo, 2005.) Herb. Kuo 05299507, 04170501, 05090601, 05090603, 04270801. Kuo, M. (2006, April). Disciotis venosa. Retrieved from the MushroomExpert.Com Web site: http://www.mushroomexpert.com/disciotis_venosa.html.